Recent findings about the lineage of a mystifying green-blooded lizard, a toxin-resistant amphibian prevalent in the rainforests of New Guinea, may aid the development of new antiviral treatments. Famous for its glossy, emerald coating, the prasinohaema lizard is a type of skink, and bears an unsettling resemblance to the offspring of a snake and a frog. A group of scientists ventured into the jungles of New Guinea to harvest DNA samples from 52 species of skinks, including six green-blooded varieties. In mapping out an evolutionary tree of the native amphibian, researchers discovered that green blood actually developed in four groups of lizards at different time periods, according to a paper published in Science Advances. 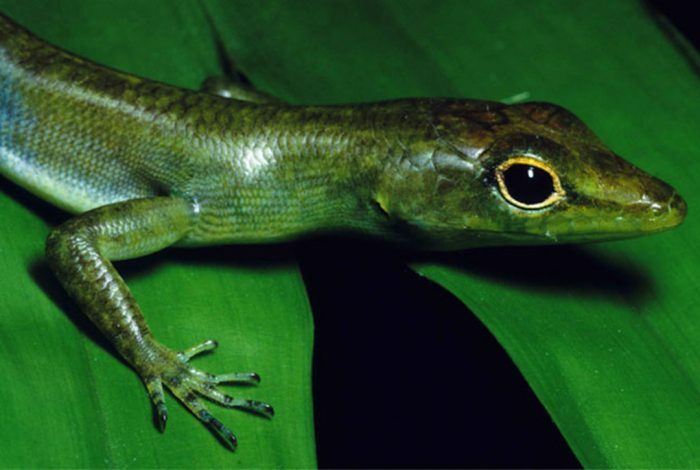 Given that multiple lineages of lizards turned green — all seemingly descended from red-blooded ancestors — experts surmised that green blood may have been favored by natural selection, and likely contains evolutionary benefits. The lizard’s fluorescent lime-green coloration is caused by elevated levels of biliverdin, a toxic bile pigment known to trigger jaundice; in sufficient quantities it overwhelms the vermilion hue of red blood cells. To put that into context, the bile concentration in a green lizard — higher than in any other animal — can kill a human 40 times over. Yet the lizards are in remarkably good health. Meanwhile, jaundice, manifested by yellowing of the skin, can be virulent in other species, including humans; one serious complication is liver failure. But this toxicity has an upside: a similar liver pigment, bilirubin, is thought to be lethal to malaria parasites in humans. Zachary Rodriguez, the lead author of the study, said that the group will work to identify the genes that are responsible for the green blood. “Understanding the underlying physiological changes that have allowed these lizards to remain jaundice-free may translate to non-traditional approaches to specific health problems,” Rodriguez said. Watch the videos below to learn more about green-blooded lizards. Related front page panorama photo credit: Adapted by WhoWhatWhy from skink (Science Advances).